Hyde House was opened as ‘Bethany’, a home for crippled boys, in 1906. Its founder and first governor was the Rev E G Hexall. The boys were cared for and taught a trade. 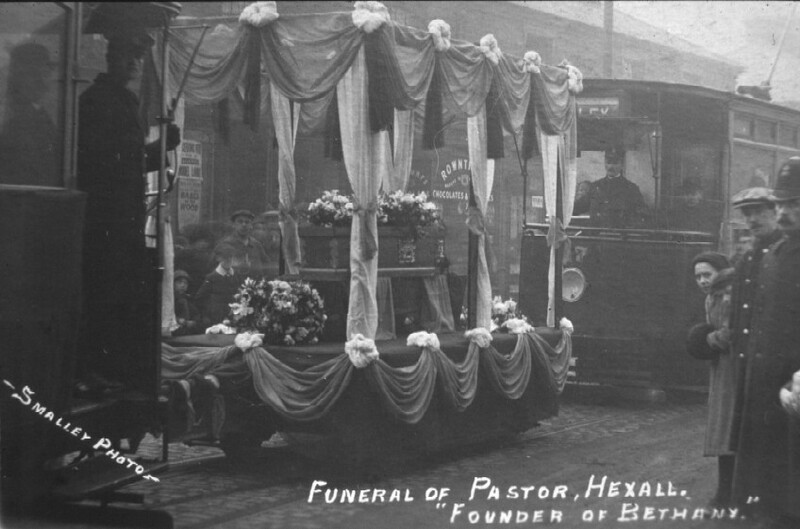 Rev Hexall was also interested in the welfare of the workers on the KLR and a measure of the esteem in which the tramway company held Hexall was seen following his death in January 1915. The company gave him a ‘tramway funeral’ on 28 January 1915 and bore his body all the way from Bethany to its final resting place in Spon Lane Cemetery, Oldbury, by tram. The coffin was carried on a truck converted from a steam tram trailer car, sandwiched between two single-decked tramcars, seen here passing through Wollaston. Bethany only outlived Rev Hexall by three years; closing in 1918.